* the Arab flags, from top left to bottom right: Palestine, Egypt, Syria, Iraq, Saudi Arabia, Lebanon and Jordan. This page shows conflicts between the Arab nations (as a group), and Israel. As a rule, a legal state of war has existed between Israel and her Arab enemies since the beginning of the first war in 1948. Egypt signed a peace treaty with Israel in 1979, and Jordan made peace in 1994. The Palestine Authority, headed by Yassir Arafat and his Al-Fatah faction of the Palestine Liberation Organization negotiated a semi-peace, which, from mid-2000 on, has been destroyed through the "Al-Aqsa" Intifada violence. Other Palestinian groups, most notably Hamas, have been at war with Israel continuously. Although Israel and most Arab nations are technically in a continuous state of war, unless otherwise noted, specific outbreaks of fighting are considered to be separate wars. Something new and historical: Want to learn how to drive a tank? Check out these tank driving experiences. 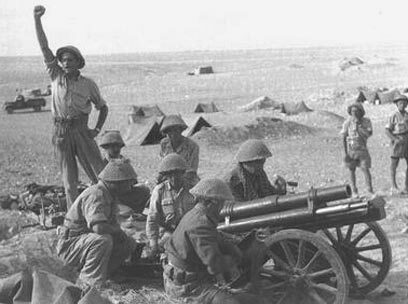 Visit the History Guy's Arab-Israeli Wars Links Page. Click on the blue links to access specific pages. Israeli War of Independence/ "al-Nakba" (The Disaster) (1948-1949)--Upon independence, Israel was invaded by the armies of six Arab nations: Egypt, Syria, Transjordan (later Jordan), Lebanon, Iraq and Saudi Arabia. In addition, local Arab Palestinian forces also fought the Jewish Israelis. Qibya Raid (October, 1951)—Israeli troops, led by Major Ariel Sharon (Israeli Prime Minister 2001-2006) destroyed dozens of buildings in the West Bank (Jordan) town of Qibya. Civilian deaths reached 69. Egyptian Seizure of the Israeli ship Bat Galim (Summer, 1954)—Egypt seized the Israeli ship Bat Galim as it attempted to enter the Suez Canal. According to various international agreements, the Suez Canal is supposed to be accessible to ships of all nations. This provoked worsening tensions between Israel and Egypt. Gaza Raid (Feb. 28, 1955)—Israeli forces conducted a raid, a response to repeated guerrilla attacks and the seizure of an Israeli ship by Egypt, resulted in the deaths of 51 Egyptian soldiers and 8 Israeli troops. This raid was the largest of its kind against Arab forces since the end of the First Arab-Israeli War in 1949. The Sinai War (1956) [Also known as the Suez War]--The invasion and temporary conquest of Egypt's Sinai Peninsula by Israel, while France and Great Britain seized the Suez Canal. First al-Fatah (PLO) Raid (Dec. 31, 1964)—Yassir Arafat’s al-Fatah faction of the Palestine Liberation Organization conducted its first raid into Israel from Lebanon. Israeli-Syrian Border and Air Battle (Nov. 13, 1964)—Israel and Syria both claimed sovereignty over several Demilitarized Zones along their border. These Zones were set up as part of the cease-fire ending the First Arab-Israeli War. Israel attempted to farm the land in these Zones, while Syria developed a project to divert water from the Jordan River, which Israel shared with both Syria and Jordan. Syrian forces often fired on Israeli tractors attempting to farm the Zones, while Israel looked for ways to interrupt the Syrian diversion project. On Nov. 13, 1964, Syrian forces stationed on the top of the Golan Heights, a plateau overlooking Israeli territory in the Jordan River valley, fired on Israeli tractors. Israeli forces returned fire. Syrian artillery then targeted Israeli civilian villages. Israel responded with air attacks on Syrian forces. This battle resulted in 4 Israeli dead and 9 wounded. Syrian losses included two tanks and machines involved in the diversion project. One result of this clash was Syria’s accelerated acquisition of more and better Soviet-made fighter planes. (Oren, 2001). West Bank Raids (May 1965)—After Palestinian guerrilla raids resulting in the deaths of 6 Israelis, the Israeli military conducted raids on the West Bank towns of Qalqilya, Shuna and Jenin. 1966—Israel reported 93 incidents along its borders. West Bank Raids (1966)—Israeli forces raided the Hebron area of the West Bank. These raids resulted in 8 civilian deaths and firefights with the Jordanian Army. Israeli-Syrian Air Battle (July 7, 1966)—Responding to the continued fighting along the border, Israeli planes attacked Syrian forces, resulting in the loss of one Syrian MiG fighter plane. Israeli-Syrian Air/Sea Battle (Aug. 15, 1966)—After an Israeli patrol boat ran aground on the eastern shore of the Sea of Galilee (according to the 1949 cease-fire agreement, Israeli forces were not supposed to approach within 250 meters of the eastern shore, which was a Demilitarized Zone), Syrian planes attacked it. Israel responded, shooting down two MiG planes. Samu Raid (West Bank) (November 13, 1966)—Following a land mine explosion which killed three Israeli policemen and wounded one, Israel decided to launch a large retaliatory raid (called Operation Shredder) into the West Bank, to strike at a Palestinian (al-Fatah) guerrilla base near Hebron. Designed to show Israeli military strength, the raiding force consisted of 10 tanks, forty half-tracks (a troop transportation vehicle) and around 400 soldiers. The force enjoyed air cover from Israeli war planes. This force destroyed a police station at the town of Rujm al-Madfa’ and then moved on to the town of Samu’. As the Israelis demolished houses in Samu’, a small Jordanian force approached and was ambushed by the Israelis. This battle resulted in 15 Jordanian dead and 54 wounded. The leader of the Israeli ambush was killed and 10 of his men wounded. Israeli planes chased off the Jordanian air force, shooting down a Jordanian fighter plane. This raid also resulted in 3 Arab civilian deaths and 96 wounded. Besides the large numbers of casualties (on both sides) from what was supposed to be a relatively swift and easy raid, Israel suffered diplomatic setbacks. The United States was quite upset over this large attack on one of Washington’s few Arab friends (Jordan’s King Hussein) and at the lack of response to the Syrians, who were the true sponsors of most Palestinian attacks in Israel. Riots broke out in Jordan at the seemingly ineffectual response of the Jordanian military and its apparent inability to protect Palestinian civilians in the West Bank. The Samu raid inflamed Arab public opinion in the Middle East and turned out to be one of the factors leading up to the Six-Day War of 1967. The Six-Day War (1967)--In a rapid pre-emptive attack, Israel crushed the military forces of Egypt, Jordan and Syria and seized large amounts of land from each. Iraq also participated in the fighting on the Arab side. The War of Attrition (1968-1970)--The War of Attrition was a limited border war fought between Egypt and Israel in the aftermath of the Six-Day War. It was initiated by Egypt as a way to recapture the Sinai Peninsula after losing it to Israel in 1967. A cease-fire in 1970 ended the fighting, but left the borders unchanged. The Yom Kippur (Ramadan) War (1973)--In a surprise attack launched on the Jewish Yom Kippur holiday (the dates also fell on the Muslim Ramadan holiday), Egypt and Syria attacked Israel. Despite aid from Iraq, the Arab forces failed to defeat Israel. Israeli Invasion of Lebanon (1978)--Operation Litani was the official name of Israel's 1978 invasion of Lebanon up to the Litani river. The invasion was a military success, as the Israeli military expelled the PLO from Southern Lebanon, where they had created a de facto state within a state. An international outcry over the invasion forced a partial Israeli retreat and the creation of a United Nations patrolled buffer zone between the Arab guerrillas and the Israeli military. See also The Israeli-Lebanon Conflict (1978-Present). The Osirak Raid (1981)--An Israeli air attack on Iraq's Osirak nuclear reactor. The Israeli Invasion of Lebanon (1982-1984)--In response to repeated guerrilla attacks by the PLO, which were launched from South Lebanon, Israel invaded with the intent of destroying Arafat's forces. Syria, which maintained a large army in Lebanon, fought Israel and suffered an embarrassing defeat. See The Israeli-Lebanon Conflict (1978-Present). The Israeli Occupation of South Lebanon (1984-2000)--As they withdrew from most of Lebanon seized in the 1982 invasion, Israel held onto a large part of Southern Lebanon with the aid of the "South Lebanon Army (SLA)," a militia set up and supported by Israel. This occupation was opposed by the PLO and other Palestinian groups as an extension of their long-running conflict with Israel. Also, other militia armies (mostly Lebanese Muslim groups), such as Hezbollah (supported by Iran and Syria), stepped up attacks on the Israeli-occupied region as well as on settlements and military targets in northern Israel. In 2000, Israel withdrew from Lebanon and the SLA disbanded. See The Israeli-Lebanon Conflict (1978-Present). The First Intifada (1987-1993)--Urban uprising against Israeli rule in the West Bank and Gaza. The Oslo Peace Accords end the Intifada and lead to the formation of the Palestinian Authority with PLO Chief Yasser Arafat as the official leader of the Palestininans. The Second Persian Gulf War (1991)--While Israel took no offensive action in this war, Iraq did launch Scud missiles which struck Israel and almost caused Israel's intervention in the Gulf War. Israeli Air Strike on Syria (October, 2003)-- Israeli warplanes hit the Syrian village of Ain al-Saheb, near Damascus. The Israeli-Hezbollah War (also known in Israel as "The Second Lebanon War (2006)--In response to repeated guerrilla attacks by the the Shiite Lebanese militia Hezbollah, Israel invaded southern Lebanon, set up a naval blockade, and launched a powerful bombing campaign in order to win the release of two captured Israeli soldiers. The Israeli-Lebanon Conflict (1978-Present). Israeli Air Strike on Syria (Sept. 6, 2007)—Israeli warplanes overflew northern Syria, dropping ordnance on a (publicly) unknown target. According to both the New York Times and ABC News, the target was a nuclear facility being built with North Korean aid and assistance. See War and Conflict Journal's article on this attack. The Gaza War (2008-2009)--War between the Palestinian Hamas rulers of the Gaza Strip and Israel. Began in December, 2008. Threat of an Israeli-Iran War--Scenarios for a possible Israeli attack on Iran, or an Iranian attack on Israel. Emphasis on the nuclear threat from Iran.